For anyone who enjoys a little baking, making holiday treats is one of the best traditions of this time of the year. Making that special cookie or sweet for our loved ones can be very fulfilling and fun. But it can also be tricky: lots of people I know have special dietary requirements, so sometimes I have to consider gluten-free or vegan options as well as allergy issues when I’m choosing a recipe. A Christmas favorite of mine from Spain (of course!) can be vegan, with just a few minor ingredient adjustments. A traditional cookie, “polvorones” get their name from their fragile, powdery consistency (“polvo” means “powder” in Spanish). Versions made with lard (“manteca”) are called “mantecados,” but this traditional recipe calls for olive oil, so these cookies would be called polvorones. For these cookies, you only need a few ingredients, just flour, olive oil, sugar, cinnamon, sesame seeds, and lemon zest. In Spain, these cookies are usually made a little thicker, but I decided to go thinner for the American version. 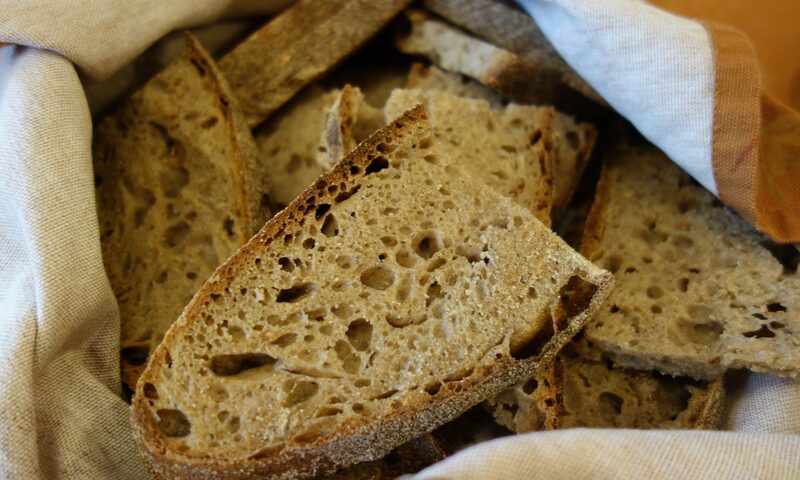 First of all you must bake the flour to dry it–probably something that you have never done before. For this you’re going to place the flour in a sheet pan and put it in the oven at 300° for 25 minutes. Let it cool down completely before moving on. Mix the sugar, olive oil and lemon zest until smooth and creamy. Then add the flour slowly, just until is mixed in. Don’t overwork it. And that is it–your dough is complete! You can let it rest in the fridge for a few minutes or work with it very quickly, while the dough is cold. As the dough gets warm, it becomes soft and hard to work with. Roll out the dough to a half-inch thickness and using a cookie cutter, cut the dough in all kinds of fun shapes and put it on a baking tray. 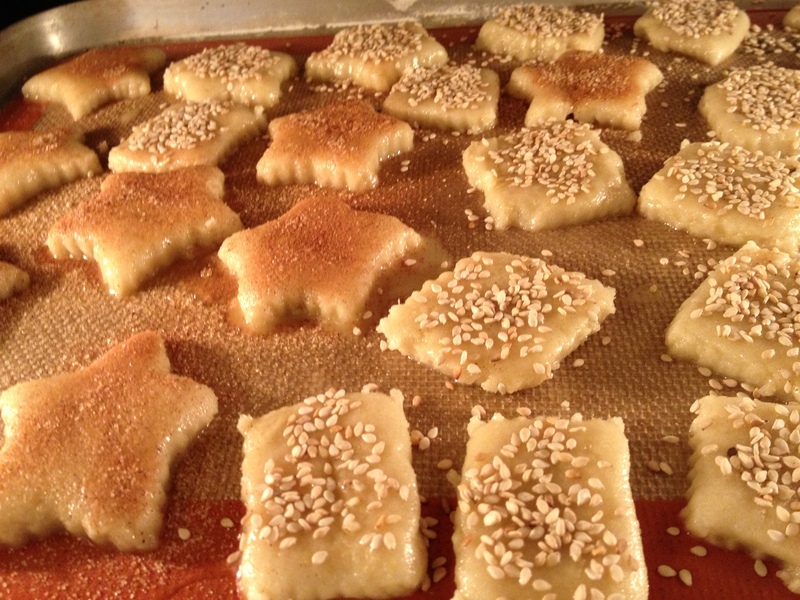 Mix sesame seeds with cinnamon and sugar and sprinkle thickly on top of the cookies. Bake for 12-15 minutes at 400°. Watch them carefully to be sure they don’t get too dark. How long you bake them depends on the thickness of the cookie. Let them cool down on the tray. You won’t be able to pick them up until they have cooled down. This can be a delicate and very tasty Christmas addition to your cookie tray. Mix just until combined--don't overwork the dough! Here you see the consistency of the polvorone cookie dough. Choosing which cookie cutter shapes to use is part of the fun. Cut quickly--try to keep the dough as cool as possible and work it as little as possible. Polvorone cookies on the baking sheet. 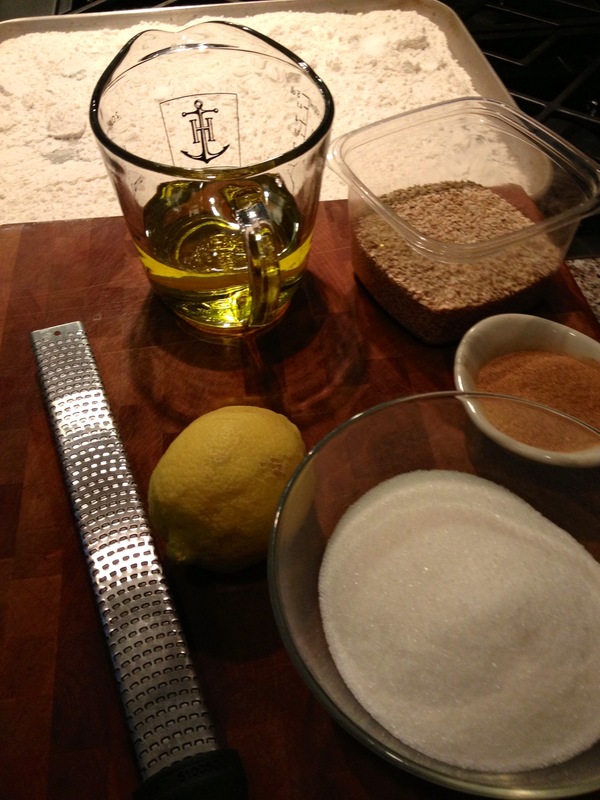 You can top with sesame seeds alone, with a mixture of cinnamon and sugar, or with a mixture of all three! Me parece genial que sigas con estas tradiciones, “Polvorones” o “mantecados”, a pesar de no estar en esta tierra.